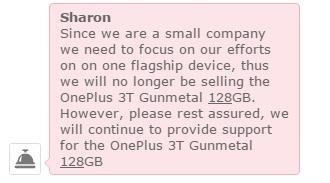 Apparently, OnePlus wants to concentrate on its newer models rather than continuing to stock the 128 GB variant of the OnePlus 3T in Gunmetal. First noted on Tweakers, a Dutch tech blog, the 128 GB version in black was noted to be out of stock in most stores. 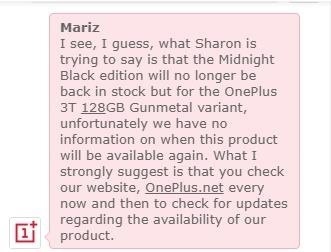 After contacting a OnePlus customer service about it, a rep confirmed that they will no longer sell the gunmetal variant. A OnePlus representative told Gadget Hacks that the discontinued phone will continue to receive updates. The company could no longer make the phone because OnePlus is a "small company" and would rather focus on just one flagship device. This leads us to speculate that the company is getting ready to focus on producing its next smartphone — the OnePlus 5. The OnePlus 5 is the company's next device and looks to be right on track to land in your hands by the upcoming summer. Stay tuned for our OnePlus 5 rumor roundup as we continue to uncover more details from the upcoming OnePlus flagship.